This will be the last post on the blog. As of February 1, I am no longer working at the IISS. I can say with confidence that the dialogue was successful in bringing together a diverse group of experts to discuss how climate change will affect a broad range of security threats. We held workshops on water, food, and energy security. We held larger conferences to bring the debate outside the experts, in both Washington and Brussels. We delivered our report (PDF) to the European Commission at the end of January. With the completion of the report, my time at the IISS has come to an end, and I have moved on. If you are looking for updates on me, take a jump over to my personal website at www.andrew-holland.com. I will also continue my blogging at www.revolutionarytransitions.blogspot.com. I will continue to look at how climate change affects security, but I will also write about the broader changes that the earth and human society are undergoing. I hope that you will update your RSS feeds and your bookmarks. Finally, if you are looking for the most up-to-date analysis of global affairs from the IISS, I would direct you to the IISS voices blog, which should be your first stop for any global security issue. Thanks go out to all who participated in our events; it would not have been a success without you. Thanks also to everyone who followed this blog from its inception to its closure. I really believe that blogging is the best way to reach a large and connected audience around the world. Thank you. 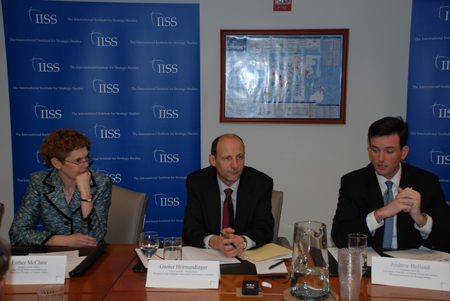 Last week, on Wednesday, January 26, the IISS held a small event to launch our report on climate change and security. This report was submitted to the European Commission, as the final results of the two years of research and conferences. You can download the report (PDF) from the IISS' server. Unfortunately for our turn-out, we decided to hold the event during a major snowstorm. We were expecting about 30 people, but the snowstorm brought it down to just a group of 15. However, the small audience made it possible to have a substantive discussion among an expert group of participants. If you are going to be in London on Monday, I would encourage you to sign-up to attend the London event of this at our headquarters. The Washington event featured your humble blogger, Andrew Holland, in my capacity as the Research Associate and Programme Manager for the IISS Transatlantic Dialogue on Climate Change and Security (right, in the picture). I spoke about the main findings and recommendations that were presented in the report. Esther McClure, the Strategy Action Officer for Arctic, Energy and Environmental Policy in the Office of the Secretary of Defence - Policy responded to the report and gave an overview of what how the Pentagon is looking at climate change (left, in the picture). She was speaking in her capacity as an expert on the issue, and was not speaking for the US government; her remarks were off-the-record, so all I can say is that she was very good, and presented some interesting ideas. The event was moderated by Günter Hörmandinger, the First Counselor for Environment of the Delegation of the European Union to the United States of America (center, in the picture).`Although you can't read any of Esther's comments, after the jump, I am happy to provide a summary of what I said at the event.